A handheld shower head allows people to create a spa-like experience from the comfort of home, and is super convenient for spraying water directly where you need it. Not only does it make bathing children and pets easier, but a handheld shower head is particularly useful for the elderly as well. Finding the best handheld shower head for your bathroom means reading reviews, studying product features, and diving into the ins and outs of available spray patterns and configurations. With the right handheld shower head, washing yourself from head to toe can become a quick, over-and-done with task. 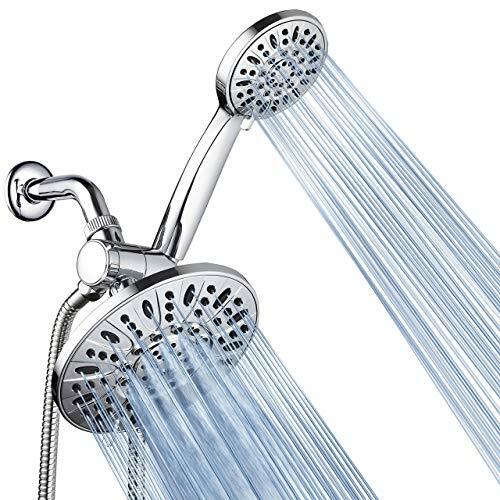 We reviewed dozens of handheld shower heads to identify the best of the best, based on Amazon reviews, how well they performed in operating tests, cost, and other considerations. We narrowed our search down to 5 of the top-rated handheld shower heads homeowners can purchase to ensure a clean and healthy wash routine. 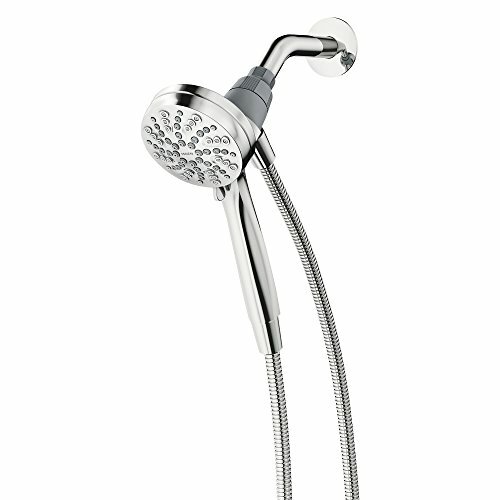 We’ve identified the Delta 7-Spray Touch Clean Hand Held Shower Head as the best handheld shower head out there. With a choice of 7 powerful spray patterns, this handheld shower head is one that will keep your daily cleansing routine running smoothly. These benefits allow you to get in and out of the shower in less time. The Delta 7-Spray Touch Clean Hand Held Shower Head took the top spot on our list of the best handheld shower heads thanks to its strong spray, with a choice of 2 GPM or 2.5 GPM models. A selection of 7 spray patterns provide soothing massage and tension relief, while the choice of two different finishes means it will match nearly any bathroom decor. Those who purchased and reviewed this handheld shower head appreciated that it was easy to assemble and install, and that the materials were durable. Purchasers liked that the holding clip was very study, and that the mounting style gave a bit of extra height in the shower. With a price tag of $24, it’s about average as far as the cost of handheld shower heads go, and the quality craftsmanship associated with the brand, as well as the ease of setup and use more than justifies that price. It has a rating of 4.1 on Amazon with more than 3,500 people reviewing it, which we think goes a long way in convincing homeowners to make the investment. The Moen Magnetix Six-Function Handheld Showerhead took the runner-up spot on our list of the best handheld shower heads, as it includes fewer spray settings and is more expensive than our top pick. That said, it is just as durable and comes complete with the brand’s signature lifetime warranty, for quality you can trust. The magnetic docking system makes it easy to detach and use this handheld shower head. Those who purchased and reviewed this handheld shower head appreciated that setup was super easy, and that it looked great in their bathroom. Purchasers with low water pressure found it to be more than adequate, and liked how smooth it was to switch between the 6 spray patterns. The majority of purchasers suggest removing the water restrictors to achieve a stronger spray. At a cost of about $45, it doesn’t come cheap, but the quality craftsmanship associated with the brand, as well as the ease of setup and use more than justifies that price. It has a rating of 4.3 on Amazon with more than 550 people reviewing it, which we think goes a long way in convincing homeowners to make the investment. The AquaDance High Pressure 6-Setting 3.5″ Chrome Face Handheld Shower is an excellent choice for those who want a handheld shower head that won’t break the bank. It offers a choice of 6 spray patterns, and is angle adjustable for added convenience. The ergonomic grip handle makes this handheld shower head comfortable to hold, while the rub-clean jets make cleaning this unit a cinch. Those who purchased and reviewed this handheld shower head appreciated that the installation instructions were easy to read and follow, and that it looked great once installed. People found the water pressure through this shower head to be more than adequate, and said it was easy to get in and out of the mount. With a price tag of around $17, this handheld shower head is a solid choice for those looking for a handheld shower head option on a budget. It has a rating of 4.3 on Amazon with more than 2,750 people reviewing it, which we think goes a long way in convincing homeowners that this budget-friendly pick is just as good at keeping them clean as its more expensive counterparts. The AquaDance Premium High Pressure 3-Way Rainfall Combo Showerhead is a great choice for those who like their showers with a lot of water pressure. It is available in a number of different sizes and configurations to suit nearly any need, and boasts a selection of 6 spray settings. It uses a click lever dial for swapping between settings, and the ergonomic grip handle makes this unit easy to hold. Those who purchased and reviewed this handheld shower head appreciated that it was easy to assemble and install, and that the materials held up well to daily use. People liked the pause feature, as well as the tool-free installation. At a cost of about $40, it doesn’t come cheap, but the quality craftsmanship associated with the brand, as well as the ease of setup and use more than justifies that price. It has a rating of 4.4 on Amazon with more than 3,150 people reviewing it, which we think goes a long way in convincing homeowners to make the investment. The Hydroluxe 24 Function Ultra-Luxury 3-way 2 in 1 Shower Head/Handheld Shower Combo is a great pick for those looking to add a little touch of spa-like luxury at home. It comes complete with a 5-setting overhead shower head and 5-setting hand shower that can be used separately or together to provide 24 full and combined water flow patterns. The patented 3-way diverter makes swapping between heads a cinch, while the angle-adjustable bracket lets you direct the spray just where you want it. 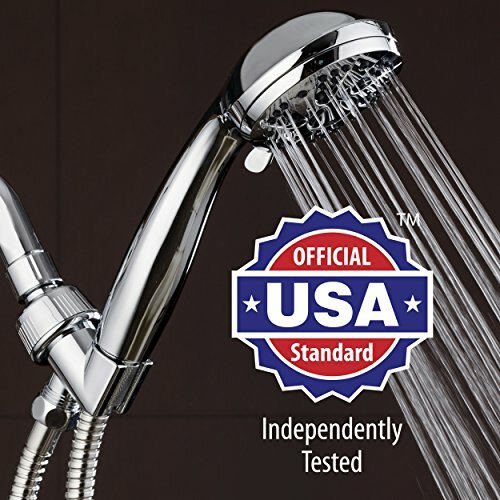 Those who purchased and reviewed this handheld shower head appreciated that it was easy to install and looked great, especially considering the wallet-friendly price point. People also appreciated that nearly every aspect of this shower head was adjustable, which makes it easy to get just the right flow and spray for your needs. At a cost of around $25, it’s a surprisingly affordable choice, and the quality craftsmanship associated with the brand, as well as the ease of setup and use more than justifies that price. It has a rating of 4.2 on Amazon with more than 7,300 people reviewing it, which we think goes a long way in convincing homeowners to make the investment. A handheld shower head is an ideal choice for those who would like the improved comfort and flexibility that a handheld shower head provides compared to traditional fixed models. Many handheld shower heads double as massagers, and offer a choice of settings that allow users to create a spa-like experience from the comfort of home. They are also convenient for spraying water directly where you need it, such as rinsing soap from hard-to-reach places, or rinsing shampoo from a young child’s hair. This control is especially appreciated by elderly and disabled persons, with models with longer hoses offering the most flexibility. They can even make bathing the family pet a breeze. You’ll also want a sturdy shower caddy to store your bath essentials. A handheld shower head is also convenient for cleaning your shower, as it’s easy to rinse the walls after your shower or tub come cleaning day. The shut-off valve on the head or handle of most models also allows for water conservation. If you’re updating your bathroom fixtures, you should also check out our review of the best bathroom faucets. Hose length. Probably one of the most important considerations when it comes to choosing a handheld shower head is the length of the hose. Too short a hose and you won’t be able to reach where you need to, but too long and it could interfere with your use of the tub. A hose length of about 60-72 inches should work well for most homes, but a hose must be at least 84 inches long in order to meet ADA compliance. Massage or spray pattern. One of the best features of a handheld shower head is the available massage or spray pattern. Pulse, rain, jet, aeration, and mist are just a few of the options available, and can help to relieve tension as well as aches and pains with ease. Water saving. If reducing water and power consumption is important to you, then a water-saving handheld shower head is an excellent option, with some models using as little as 1 gallon per minute (gpm). Many use an aerator and booster to give the impression of dispensing more water than they actually do not. This is also handy in places where low water pressure is a concern, as it can make it seem like the water pressure is better than it actually is. Dual spray. Some handheld shower heads are designed with a dual fixed and handheld system, where the mounted cradle unit sprays water along with the handheld unit. Water can be diverted to either or both heads. Price point. Finally, consider how much you are willing to spend on a handheld shower head. Handheld shower heads vary in price from $20-$100 or more. Keep an eye out for store sales and discounts or manufacturer’s coupons that can make buying a handheld shower head more affordable. What is a handheld shower head and how does it work? A handheld shower head is a type of shower head that is connected to a long hose, and sits in a cradle when it is not in your hand. While in the cradle, a handheld showerhead operates just like a fixed shower head. However, once taken off the cradle their versatility really shines. They can be used for tasks such as bathing pets, washing children, and even for cleaning the tub and shower walls. Water flows through the hose and out the head. How do you install a handheld shower head? Installing a handheld shower head is actually quite simple, and can be accomplished by nearly anyone — even if they don’t consider themselves to be very handy. They can easily be installed in a matter of minutes with little to no mess. The first step in installing a handheld shower head is to remove the old shower head. You can do this by twisting the head in a counterclockwise motion until it comes off the shower arm. Next, clean any rust or mineral deposits, old tape, or leftover sealant from the shower arm threads before wrapping Teflon tape two or three times around the threads of the shower arm in a clockwise direction. Press the tape into the threads, then screw the hand-held shower mount onto the shower arm and hand-tighten. Connect the shower hose to the mount and to the handheld shower head, hand tightening the connections. Place the handheld shower head in the mount and turn the water on to test for leaks. How do you replace a handheld shower head hose? If your handheld shower head hose begins to leak from a hole or crack, you’ll want to replace it. You may also want to replace the hose for a longer or shorter option. In either case, you’ll need to unscrew the current hose from both the mount and the shower head. Then, you can simply screw in the new hose and you’ll be good to go. 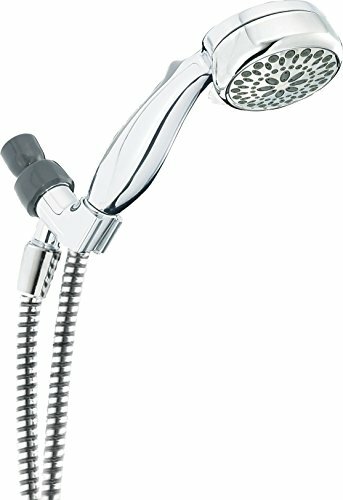 How high should a shower head (or holder) be? 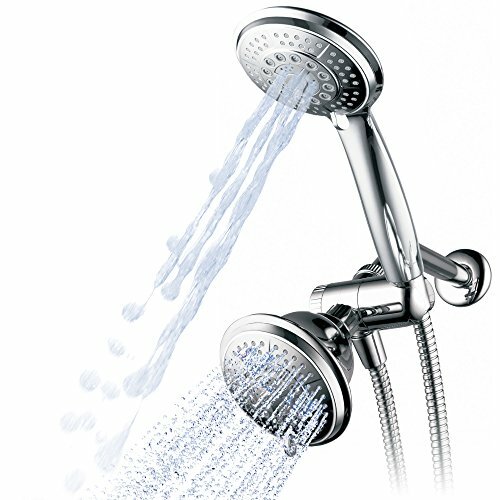 A shower head (or holder) should be mounted around 78 inches from the bottom of the floor. That said, there is no standard or uniform shower height and different contractors will place shower arms at different heights. The height of the shower arm coming out of your wall will determine how high your shower head will be. Many handheld shower head mounts do, however, feature a pivoting design that allows you to adjust the angle of spray when the head is mounted in the cradle. We looked at 20 other handheld shower heads. Even though they didn’t make our 5 best handheld shower heads list, they’re the best of the rest and each is still a great option for your bathroom. The information you’ll need to compare each one is included with the listing. This high pressure handheld shower head boasts a choice of three different spray patterns, and comes complete with all required mounting and installation components. This high pressure handheld shower head boasts a selection of 5 different spray options, and comes complete with an ergonomic grip handle and angle-adjustable brass swivel ball bracket to provide the perfect angle. This high pressure handheld shower head boasts a choice of 7 spray settings, and comes complete with a pause function to help cut down on water consumption. This high pressure handheld shower head boasts a selection of 5 different spray patterns, and tool-free installation for added ease and convenience. This high pressure handheld shower head boasts a choice of 5 different spray patterns, and makes it convenient to bathe children, pets, and those who require assistance with ease. This high pressure handheld shower head boasts a selection of 6 different spray patterns, and is available in a number of configurations to suit any needs. This high pressure handheld shower head boasts a choice of 7 different spray patterns, and comes complete with an extra long hose for added convenience. This massaging handheld shower head boasts a selection of 6 different spray patterns, and comes complete with a magnetic docking system which makes removing and using this handheld shower head a breeze. This massaging handheld shower head boasts a choice of 5 different spray patterns, and comes complete with an extra long flexible shower hose. It offers universal connectivity for use in any shower. This massaging handheld shower head boasts a selection of 6 different spray patterns, and includes a water-saving trickle function to help cut down on water usage. This massaging handheld shower head boasts a choice of 6 different spray patterns, and is made from solid brass for added durability and longevity. This massaging handheld shower head boasts a selection of 7 different spray patterns, and is available in a number of different configurations to suit any bathroom needs. This massaging handheld shower head boasts an easy to use twist operation, which moves the spray from hard to soft with ease. This massaging handheld shower head boasts a choice of 7 different spray patterns, and comes complete with a 5-foot long flexible metal hose. This handheld shower and showerhead combo boasts a selection of 24 full and combined water flow patterns, and includes an angle-adjustable overhead bracket for getting just the right spray point. This massaging handheld shower head boasts a choice of 5 different spray patterns, and features a 2-in-1 design for added value and convenience. This massaging handheld shower head boasts a selection of 8 different spray patterns, and is available in a number of different configurations to suit any bathroom needs. This massaging handheld shower head boasts a choice of 5 different spray patterns, and features a unique anti-clog design that cuts down on cleaning frequency. This massaging handheld shower head boasts a selection of 6 different spray patterns, and comes complete with Microban antimicrobial anti-clog jets to help provide more power. This massaging handheld shower head boasts a choice of 28 full and combined water flow patterns, and comes complete with a flexible, double-reinforced stainless steel hose with dual buckle.